Last week, in the post “Why Your Special Offer Isn’t” we talked about the importance of humanization. Faced with an invitation avalanche, consumers will respond to the stories that resonate with them on a personal level. And those stories don’t just have to live in social media. 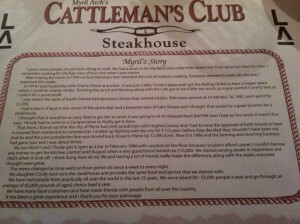 Recently, I was in Pierre, South Dakota giving a presentation at the Governor’s Conference on Tourism, and ate dinner at the Cattleman’s Club Steakhouse – which I found via iPhone’s Yelp application. It’s a small place, casual and charming with a friendly staff, and damn good steaks. But that’s not the point. I guess some people are just born liking to cook. We had a ranch in the Big Bend area a few miles down river from what was then De Grey. I remember cooking for the hay crew of four men when I was twelve. After buying the ranch in 1954 we butchered our own beef and did a lot of outdoor cooking. Everyone seemed to really like the way I seasoned the steaks. In 1974 I purchased the Little Chef in Pierre at auction. It was just a little 10-stool place and I got the feeling I’d like to have a bigger place where I could do mainly steaks. Running the ranch and farming along with the Cafe got to be a little too much, so a guy wanted it pretty bad, so I sold it for a good profit. I saw where the state of South Dakota had declared a house they owned surplus. Bids were opened at 10am November 16, 1981, and I got it for $3000. I had a piece of land in the corner of the ranch that had a beautiful view of Lake Sharpe and I thought that would be a great location for a steakhosue. I thought that it would ber an easy deal to get the six acres it was going to sit on released from the FHA loan I had on the ranch. It wasn’t that easy. I finally had to write to a Congressman to finally get it done. That done, I found out that the city of Pierre had joint jurisdiction with Hughes County and I had to have the approval of both boards to have it rezoned from residential to commercial. I ended up fighting with the city for 3 1/2 years before they decided they shouldn’t have been out that far and the joint jurisdiction line was moved back closer to Pierre by 12,000 acres. 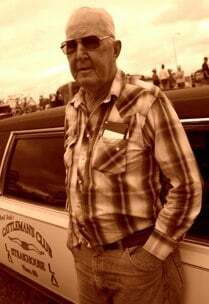 Now it is 1986 and the farming and ranching business had gone sour and I was about broke. My son Myril II and I finally got it open as a bar in February 1986 with sawdust on the floor because we couldn’t afford carpet. I couldn’t borrow any money to get the kitchen started until August when a very good friend loaned me $10,000. We started serving steaks in September and that’s when it took of. I think living here all my life and having a lot of friends really made the difference, along with the steaks everyone thought were great. The men changed as time went on from prime rib twice a week to every night. My daughter Cindy now runs the steakhouse and provides the same food and service that we started with. We have had people from practically all over the world in the last 15 years. We serve about 50,000 – 55,000 people a year and go through an average of 60,000 pounds of aged, choice beef a year. We have many loyal customers and have made friends with people from all over the country. It has been a great experience and I thank you for your patronage. Wow. Myril’s story has a lot of twists and turns, and reads like a Coen brothers’ script. Although he wasn’t in the night I ate there, I feel like I know Myril. At the very least, I feel like I know something about him and what he’s been through, and how much he cares about his restaurant. And that will stick with me for a very, very long time. What the owner of a small steakhouse in South Dakota can teach all of us about social media is that your story – whatever it is – has humanizing value. You just need to realize that what you think is boring or routine, your customers just might find fascinating.